We chatted about gloves for road warrior ladies yesterday (The Vixen Gloves), so today we thought it was a perfect time to talk about the gloves from the original Road Warrior himself: Mad Max! The Max Gloves have been a part of the AbbyShot catalogue since way back in 2006 when a line of Mad Max inspired products were released (including of course the Max Jacket and Max Badges), all based on the very first Mad Max film. Ever since then these black leather gloves have been a hit with Mad Max aficionados around the world – appearing everywhere from annual car shows to a post-apocalyptic party in the desert called the Road Warrior Weekend Event (where the awesome photo to the left was taken!). Why so popular, you may ask? 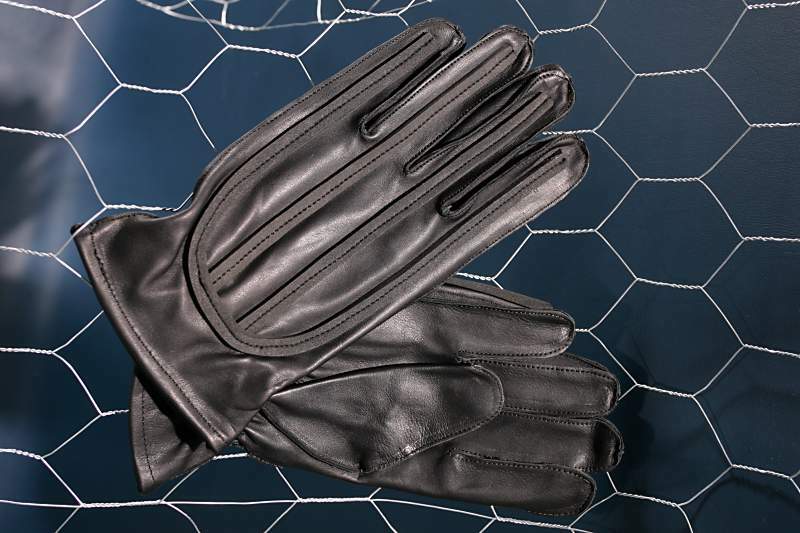 Because these are no ordinary gloves! The Max Gloves were an especially interesting addition to the AbbyShot catalogue because, at the time, AbbyShot was not offering ANY glove designs at all! But Mad Max fans were adamant: We absolutely had to offer these gloves alongside Max’s leather jacket. And so it was because of Mad Max fans that AbbyShot’s glove line was born! So what makes the Max Gloves stand out? The most obvious factor is the foam used on the gloves – there are strips sewn down the tops of all the fingers and down the back of the hand. It is definitely a distinctive look, though we’re not sure what the post-apocalyptic functionality of this foam could be! Are there any Mad Max fans out there with insight or theories into this one? As for the design of the glove itself, we have learned that the gloves worn by Mel Gibson and the other actors in Mad Max were actually a type of leather motocross glove that was readily available in Australia the 1970’s. Of course this particular glove style faded over time so it ‘looked like a job for AbbyShot’ to bring these gloves back from the great beyond! Need leather gloves that will help you survive in a post-apocalyptic world? Look no further than the AbbyShot Max Gloves, Road Warriors! The post Love The Gloves Part 7: Max Gloves appeared first on .